Vacation over and my apologies, this isn't what I wanted to post but it is the only thing I had prepared :). With that said, when I was a kid I really enjoyed granola bars and like most things it wasn't the ones with the chocolate or marshmallows that were my favourite. I liked the ones that were “healthier,” the ones that didn't add extra sugar on top of the extra sugar :). 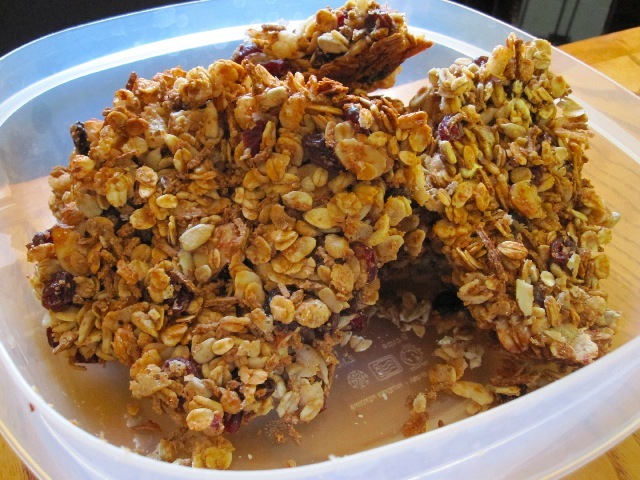 I had been planning to make my own granola bars with ingredients I like for some time but never got around to it. Probably because it was something that I wanted to make for work and thinking about Monday morning on a Saturday afternoon is about as fun as going to the dentist after 10 years (true story). But with the closing date for my house quickly approaching I am trying to find more ways to be cheap. Those who know me are currently sitting with mouths agape and eyes wide, wondering: "How could he possibly be anymore cheap?" My answer: Like this. I checked around to determine what proportions of stuff to other stuff would work to give me crispy crunchy granola bars instead of pieces. As for the makeup of the granola, other than the required oats I decided on Special K instead of Rice Krispies (or "puffed rice" if you want to get all PC on me :), but also dried cranberries, raisins, and unsalted sunflower seeds (all on sale). I wanted some type of nut as well and went with almond slivers (to avoid big chunks). I chose honey as my sweetener and for fibre I grabbed a box of All Bran proper and a little wheat bran. The final piece to the puzzle would be the most glorious substance of all: peanut butter! In a surprising twist I used all natural pb (100% peanuts) because I didn't want anymore sugar or salt. In theory making granola is stupid easy. Just dump it all together, pour on your melted honey and peanut butter, mix, press into pan and bake. It really looked like it was going to work. Once cooled I went to cut it into bars and it didn't completely hold together, becoming pieces instead. Normally this would send me into a fit of rage, but granola is granola, and it tastes just as good in pieces (only not as convenient). And how good was it? Let's just say that the entire 8x8 pan was finished by the next morning. It was fantastic and going forward I will be making my own granola as often as possible. Apart from the cost savings, it really does taste better (like most things). I'm not exactly sure what was wrong, maybe there was just too much good stuff. Whatever it was I loved this particular combination of flavours and it's worth further experimentation. It just tastes so good. Besides, I shouldn't complain about ending up with pieces. After all, pieces were good enough for H. B. Reese (and E.T. :)). Preheat oven to 325F and line an 8x8 cake pan with foil. In a large bowl add all ingredients except honey and peanut butter and mix thoroughly. In a small sauce pan set over medium heat, add honey and peanut butter and stir until melted and combined. Pour honey-pb mix over dry ingredients and stir together until everything is combined and evenly coated. Press mixture into prepared baking pan, making sure to pack everything firm. Remove from oven and press firm again with wooden spoon -- I missed this step, perhaps that's why it didn't hold together. Allow to cool completely before attempting to slice into bars. If that doesn't work break it up into pieces and enjoy. Love the title Granola NOT bars! You are a clever one! Do you think chunky PB would work? You really have a thing for chunky peanut butter :)... But I dunno, it's tough to say since technically the bars didn't work. Granted it might have been the fact that I used natural pb instead of regular. I would just increase the amount of PB if using chunky, or just replace the almonds with chopped peanuts :). And thanks, I was kind of proud of that title.... I live a sad life :). I love granola but cookies are always more fun, doesn't matter what the day :). I need a good banana bread recipe-every year I enter it and every year I get nothing. Do you have one you could suggest without giving away any of your secrets? It's a wonderfully simple recipe that leaves a lot of room to play. I would suggest a little more banana (depending on the size) and reduced amounts of sugar. The bake time is going to depend on your oven, but I've found that an hour is too long for this size recipe.